Take a look at all the family friendly events happening in and around Dublin over the next week for you to enjoy. Please check that they are still running before setting out, as sometimes even the best events have to be postponed. Did you know that the City of Dublin was established by the Vikings? Take a tour of our Viking Ireland exhibition to learn more about what the archaeology of Dublin can tell us about Viking raiders, traders and settlers. See the skeleton of a Viking warrior, examine the beautiful oval brooches worn by Scandinavian women and discover ice skates made of bone! How much? Free, no booking required. Places are limited and allocated on a first come basis. Meet at Reception. Not wheelchair accessible. Drop into the Discovery Zone this Christmas to meet wolf and some other furry friends from the handling collection at the Dead Zoo! How much? Free, No booking required but there may be a short waiting time. Wheelchair accessible. Have a creative start to your New Year’s celebrations during this family drop in workshop with artist Olive Knox. How much? Free, no booking required although numbers may be limited. Don’t miss the 2018 Winter Wonderland Grand Finale! • Movies, Live DJ and Fireworks Display! • ‘Whack-A-Mole’ and a whole lot more Fun Games! Join artist Eimear Murphy for a special Christmas edition of our weekly drop-in family workshop. Children and their parents/guardians/carers are encouraged to work together on creative projects. Drop-in and stay for as long (or as little!) as you wish. When Sunday from 11.30-1.30 drop in session. 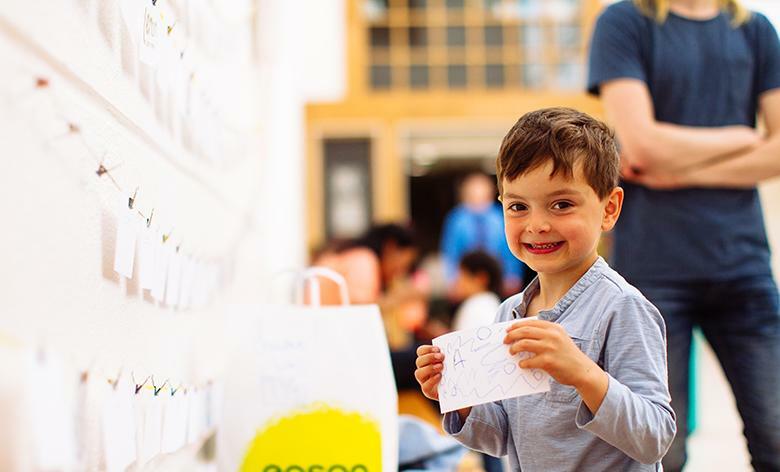 During these free sketching workshops for families we invite you to explore and respond to or collection and temporary exhibitions through discussion and drawing. Bring your own sketchbook or avail of the drawing materials provided. Join us for a special tour designed for children and their guardians, parents and carers. 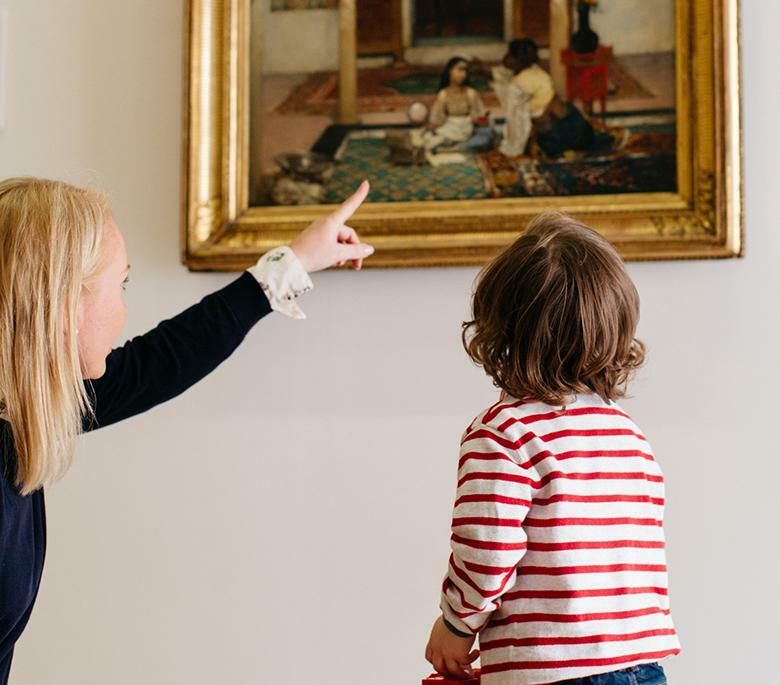 Our aim is to make the artworks fun and engaging for kids, and to welcome families and visitors of all ages and encourage them to feel comfortable in the Gallery. All welcome; no booking necessary. Storyteller Paul Timoney invites children and families to join him for some Christmas tales and adventures, featuring LauraLynn’s The Much More Magnificent Seven. How much? Free, but tickets must be booked for all attendees. Ages suitable for this event is most suitable for children aged 6+, but younger children are welcome. How much? Free, no booking required but there may be short waiting time. Wheelchair accessible. Mini Medieval Architects – Make your own Tower House! Tower Houses were built all around the Irish landscape in Medieval Ireland and can still be seen today. They were the defended homes of lords and ladies. Drop in to the National Museum of Ireland to handle replicas of the objects that were used in these homes from pottery to weapons, and explore the architecture of these castles as you make your own Tower House! How much? Free, No booking required. Meet at the Reception. Places allocated on a first come basis. Wheelchair accessible. 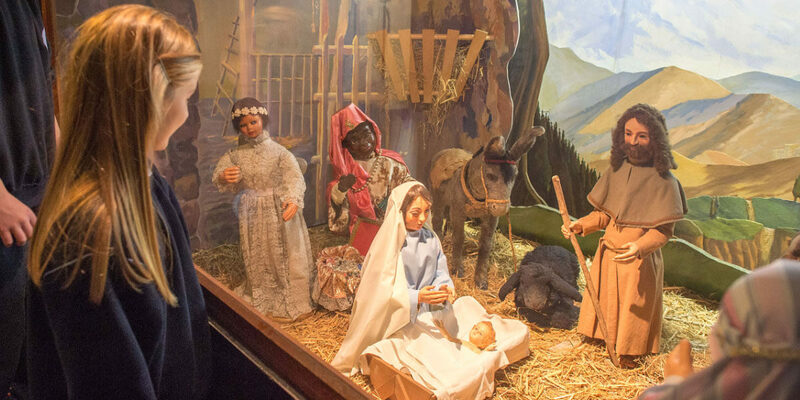 Yet again, one of Dublin’s oldest treasures, The Moving Crib at 42 Parnell Square West, Dublin 1 will be opening its doors this Christmas Season from the 27th of November. This is its 62nd year captivating generations of families. Children and adults alike and best of all it’s FREE! It’s history and old world charm is unchanged and has led to many describing it as a wonderful hidden gem in Dublin City and “a real Dublin Institution” that will give you “a warm glow for the true meaning of Christmas”. Winding your way down to the basement of this stunning Georgian building, you are greeted with a montage of many historical / fun stories, including Noah’s Ark, The Wise Men and many more, its scenes, competitions, an illusion wall and a little touch of magic are all sure to guarantee a fun day out for all the family! Children are encouraged to draw and colour a Leaf, cut out the shape and bring it with them so that they can be placed in the Garden of Eden forever. The Moving Crib, the mention of which always evokes a smile and fond memories of Dublin in the ‘rare auld times’ is the only one of its kind built in Ireland (if not the world); it is a historical and entertaining experience. This Dublin landmark is as captivating today as it was when it first opened its doors in 1956 and admission is still FREE. Be sure to visit this year and don’t miss the wonderful Bray Gospel Choir whose passion for Gospel and Soul music is renowned and who will be performing here on Sunday 9th December. Pre book or pop the events below into your diary for future family fun. Meet the King who has banned feelings and colours from his Kingdom in this fun and interactive workshop for 3 to 5 years olds and their grown-ups. In partnership with First Fortnight. The King finds feelings confusing so he says no one can laugh or cry when he’s around. Feelings of happiness, sadness or anger are not allowed. He wants everything and everyone to be grey and gloomy all day long – so he’s banished colours as well. Be part of a group of brave, young adventurers who decide this can’t be right, so go an a mission to collect the missing feelings and colours and bring them back to the Kingdom. 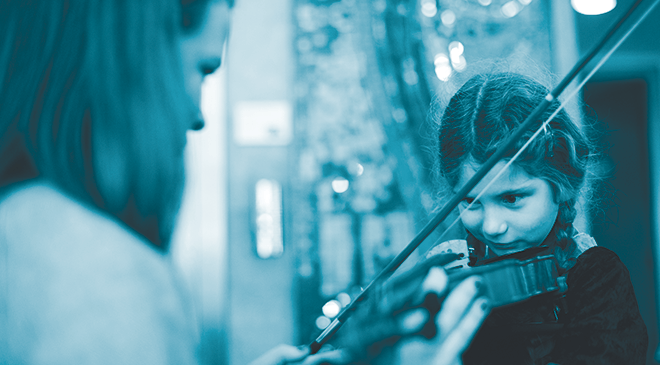 Suitable for beginners or newcomers to Irish music, each participant will enjoy a short 15 minute introduction to playing one traditional instrument and complete a simple musical task on that instrument. Participants will get a certificate of participation at the end of the session. How much? Free entry. Places will be allocated on the day. We hope that you have a great week. If you have a baby, wobbler or toddler, why don’t you book and join one of our PlayLabs? 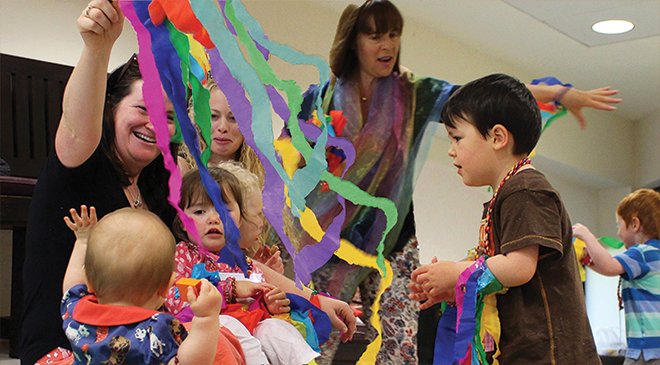 If you are looking to organise a party, we offer PlayParty for 1-2-year-olds. For 3, 4 & 5-year-olds we offer Classic Parties and children 6+ there are 4 great themed parties that school children seem to LOVE! Take a look at RealPartyKids . 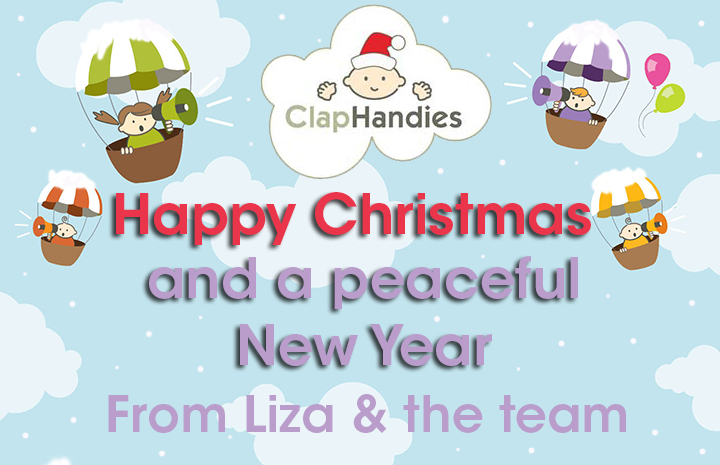 If you have an event you would like us to promote, please email marie@claphandies.com or message us through our Facebook page.